Cream cheese is a soft, usually mild-tasting fresh cheese made from milk and cream. Stabilizers such as carob bean gum and carrageenan are typically added in industrial production. The U.S. Food and Drug Administration defines cream cheese as containing at least 33% milk fat with a moisture content of not more than 55%, and a pH range of 4.4 to 4.9. Similarly, under Canadian Food and Drug Regulations cream cheese must contain at least 30% milk fat and a maximum of 55% moisture. In other countries, it is defined differently and may need a considerably higher fat content. Cream cheese is not naturally matured and is meant to be consumed fresh, so it differs from other soft cheeses such as Brie and Neufchâtel. It is more comparable in taste, texture, and production methods to Boursin and Mascarpone. Early types of cream cheese are mentioned in England as early as 1583 and in France as early as 1651. Recipes are recorded soon after 1754, particularly from Lincolnshire and the southwest of England. Recipes for cream cheese can be found in U.S. cookbooks and newspapers beginning in the mid-18th century. By the 1820s, dairy farms in the vicinity of Philadelphia and New York City had gained a reputation for producing the best examples of this cheese. Cream cheese was produced on family farms throughout the country, so quantities made and distributed were typically small. Around 1873 William A. Lawrence, a dairyman in Chester, New York, was the first to mass-produce cream cheese. In 1872, he purchased a Neufchâtel factory. 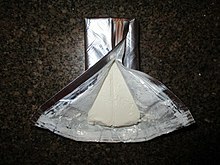 By adding cream to the process, he developed a richer cheese that he called “cream cheese”. In 1877 Lawrence created the first brand of cream cheese: its logo was a silhouette of a cow followed by the words "Neufchatel & Cream Cheese". In 1879, to build a larger factory, Lawrence entered into an arrangement with Samuel S. Durland, another Chester merchant. In 1880, Alvah Reynolds, a New York cheese distributor, began to sell the cheese of Lawrence & Durland and called it "Philadelphia Cream Cheese". By the end of 1880, faced with increasing demand for his Philadelphia-brand cheese, Reynolds turned to Charles Green, a second Chester dairyman, who by 1880 had been manufacturing cream cheese as well. Some of Green’s cheese was also sold under the Philadelphia label. In 1892 Reynolds bought the Empire Cheese Co. of South Edmeston, New York, to produce cheese under his "Philadelphia" label. When the Empire factory burned down in 1900, he asked the newly formed Phenix Cheese Company to produce his cheese, instead. In 1903 Reynolds sold rights to the "Philadelphia" brand name to Phenix Cheese Company, which was under the direction of Jason F. Whitney, Sr. (It merged with Kraft in 1928). By the early 1880s Star cream cheese had emerged as Lawrence & Durland's brand, and Green made World and Globe brands of the cheese. At the turn of the 20th century, New York dairymen were producing cream cheese sold under a number of other brands, as well: Triple Cream (C. Percival), Eagle (F.X. Baumert), Empire (Phenix Cheese Co.), Mohican (International Cheese Co.), Monroe Cheese Co. (Gross & Hoffman), and Nabob (F.H. Legget). Cream cheese became popular in the Jewish cuisine of New York City, where it is commonly known as a "schmear". It is used on bagels, and is the basis of bagel and cream cheese, a common open-faced sandwich. Lox, capers, and other ingredients are often added to this dish. The basic bagel and cream cheese has become a ubiquitous breakfast and brunch food throughout the United States. Cream cheese is easy to make at home, and many methods and recipes are used. Consistent, reliable, commercial manufacture is more difficult. Normally, protein molecules in milk have a negative surface charge, which keeps milk in a liquid state; the molecules act as surfactants, forming micelles around the particles of fat and keeping them in emulsion. Lactic acid bacteria are added to pasteurized and homogenized milk. During the fermentation around 22 °C (72 °F), the pH of the milk decreases (it becomes more acidic). Amino acids at the surface of the proteins begin losing charge and become neutral, turning the fat micelles from hydrophilic to hydrophobic state and causing the liquid to coagulate. If the bacteria are left in the milk too long, the pH lowers further, the micelles attain a positive charge, and the mixture returns to liquid form. The key, then, is to kill the bacteria by heating the mixture to 52–63 °C (126–145 °F) at the moment the cheese is at the isoelectric point, meaning the state at which half the ionizable surface amino acids of the proteins are positively charged and half are negative. Inaccurate timing of the heating can produce inferior or unsalable cheese due to variations in flavor and texture. Cream cheese has a higher fat content than other cheeses, and fat repels water, which tends to separate from the cheese; this can be avoided in commercial production by adding stabilizers such as guar or carob gums to prolong its shelf life. In Canada, the regulations for cream cheese stipulate that it is made by coagulating cream with the help of bacteria, forming a curd which is then formed into a mass after removing the whey. Some of its ingredients include cream (to adjust milk fat content), salt, nitrogen (to improve spreadability) and several gelling, thickening, stabilizing and emulsifying ingredients such as xanthan gum or gelatin, to a maximum of 0.5 percent. Regulations on preservatives used are that either sorbic acid, or propionic acid may be used independently or combined, but only to a maximum of 3,000 parts per million when used together. The only acceptable enzymes that can be used in manufacturing of cream cheese to be sold in Canada are chymosin A and B, pepsin and rennet. In Spain and Mexico, cream cheese is sometimes called by the generic name queso filadelfia, following the marketing of Philadelphia branded cream cheese by Kraft Foods. 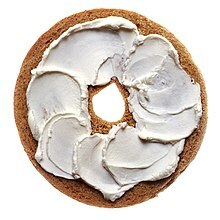 Cream cheese is often spread on bread, bagels, crackers, etc., and used as a dip for potato chips and similar snack items, and in salads. It can be mixed with other ingredients, such as yogurt or pepper jelly, to make spreads. Cream cheese can be used for many purposes in sweet and savoury cookery, and is in the same family of ingredients as other milk products, such as cream, milk, butter, and yogurt. It can be used in cooking to make cheesecake and to thicken sauces and make them creamy. Cream cheese is sometimes used in place of or with butter (typically two parts cream cheese to one part butter) when making cakes or cookies, and cream cheese frosting. It is the main ingredient in the filling of crab rangoon, an appetizer commonly served at U.S. Chinese restaurants. It can also be used instead of or with butter or olive oil in mashed potatoes, and in some westernized sushi rolls. It can also be used for ants on a log. American cream cheese tends to have lower fat content than elsewhere, but "Philadelphia" branded cheese is sometimes suggested as a substitute for petit suisse. ^ a b "Merriam-Webster Online Dictionary". Retrieved 14 August 2011. ^ "Cream Cheese". Bon Appetit. Retrieved 1 April 2017. ^ "US Code of Federal Regulations". Retrieved 5 November 2014. ^ "BBC - Food - Cream cheese recipes". Retrieved 1 April 2017. ^ The story, found in numerous cheese histories, that Lawrence “accidentally” made cream cheese or had stolen the recipe from another Chester dairyman, Charles Green, is a fabrication. Jeffrey A. Marx, "The Days Had Come of Curds and Cream": The Origins and Development of Cream Cheese in America, in Journal of Food, Culture and Society, Vol. 15, Issue 2, June 2012. ^ Jeffrey A. Marx, “Philadelphia Comes to New York: The Marketing of Cream Cheese in New York State,” New York History, Quarterly Journal of the New York State Historical Association and The State University of New York College at Oneonta, 96, no. 2 (2015). Histories that imply the cheese was produced in Philadelphia, Pennsylvania, or Philadelphia, New York, are incorrect. Marx (2012); International Cheese Company v. Phenix Cheese Company (1906). ^ Marx (2012, 2015); International Cheese Company v. Phenix Cheese Company (1906). ^ Marx (2012); W.A. Lawrence et al v. P. E. Sharpless Co. (1912); International Cheese Company v. Phenix Cheese Company (1906). ^ McDaniel, C.; Kendall, Patricia (January 2007). "Making soft cheeses". Colorado State University Extension. Archived from the original on 14 July 2012. ^ a b Davis, Joshua (June 2006). "Schmear Campaign". Wired. Vol. 14 no. 6. Condé Nast Digital. Retrieved 19 December 2012. ^ Puniya, Anil (2016). Fermented Milk and Dairy Products. Florida: CRC Press. p. 342. ISBN 978 1 4665 7800 5. ^ Meehan, Peter (6 November 2005). "Filadelfia Story". Retrieved 1 April 2017 – via NYTimes.com. This page was last edited on 18 April 2019, at 06:31 (UTC).